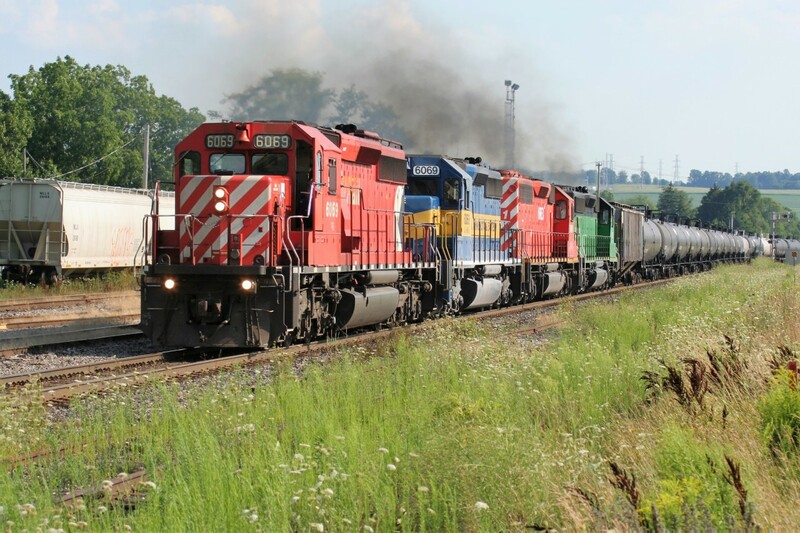 Railpictures.ca - Jason Noe Photo: An eastbound Canadian Pacific (CP) ethanol train is seen making its way through the CP yard in Woodstock, Ontario with a consist that includes; CP SD40-2 6069, DME SD40-3 6069 and two leaser SD40-2′s. | Railpictures.ca – Canadian Railway Photography – photographie ferroviaire Canadienne. Copyright Notice: This image ©Jason Noe all rights reserved. Caption: An eastbound Canadian Pacific (CP) ethanol train is seen making its way through the CP yard in Woodstock, Ontario with a consist that includes; CP SD40-2 6069, DME SD40-3 6069 and two leaser SD40-2's. Man, I miss these days. Very nice catch ! Beautiful! Complete with the air conditioner turned up to high. Lets see now. Lots of smoke. 2 units with the same number (both in the ideal up front spot), CP leasing one of it’s old engines, and a BN still in the the green and black. An ultimate SD40 lineup. I’m giving this “Super Excellent”.